Winter is coming on the Game of Thrones™ slot! 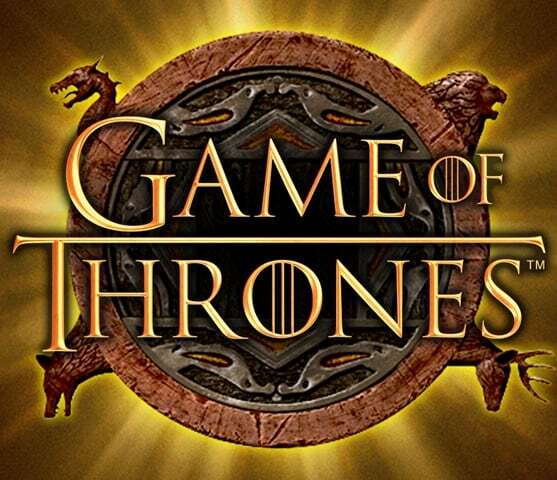 One of the biggest television series of our times, Game of Thrones™, brings you an amazing online slot game that captures the excitement and adventure as the different houses fight for the iron throne to be the ruler of the seven kingdoms. Play with 4 of the main houses: house of Baratheon, Lannister, Stark and house of Targaryen and aid them in their quest to be the victorious ruling house. Play the 5×3 reels slot on multiple platforms on either your desktop or mobile devices. There are 2 versions of the game, Game of Thrones™ 243 Ways, where you can bet with a minimum of $/€0.3, and Game of Thrones™ 15 Lines, where you can bet with a minimum of $/€0.15. The Game of Thrones™ slot is full of unbelievable features such as the coin flip feature, where you get an opportunity to flip an ancient coin to decide your fate. This gives you a chance to gamble your winnings by calling heads or tails, which will advance you along a Trail Map featuring a host of creatures that prowl Westeros and Essos and double your winnings if guessed right. If you land 2 Iron Throne scatters anywhere on the reels, a fiery dragon’s egg will appear, revealing a random consolation cash prize. If you land three scatters, you will be given the opportunity to serve one of the four greatest Houses of Westeros by choosing one of 4 Free Spin features. Enjoy 10 Free Spins with the House of Lannister at a 4x multiplier complete with the roaming Lannister High Symbol stacked 4 deep. Enter the fierce House of Baratheon during their reign over 8 Free Spins. This royalty feature boasts the highest multiplier of the game, while the Baratheon High Symbol is stacked 3 high throughout the reels. Run with the pack of direwolves in the House of Stark’s Free Spin feature and claim 14 frosty Free Spins complete with a 3x multiplier and reels with the Stark High Symbols stacked at 5 high. Battle it out with the firebreathing dragons of house of Targaryen and sizzle yourself with the 18 Free Spins feature. This feature offers the highest number of Free Spins at a 2x multiplier while stacked Targaryen High Symbols swoop past. The number of lines wagered is constant. The symbol will pay in any position. Wilds are stacked 3 up in Base Game and Free Spins. 2 Scatters anywhere on the reels will trigger the Scatter Bonus and awards you a random cash prize. You can gamble until you reach the Gamble limit, or until you complete the Trail Map. Experience this multi-award winning series though this entertaining slot and stand a chance to win big! If you are not already a Game of Thrones™ fan, you will definitely become! All in all, this slot is one of the best Microgaming games out there. Try is now and you can win huge jackpot of 605,000!